One of the many benefits of being an AERC member is the enhanced Member Page on www.aerc.org. The AERC Website Committee has worked diligently to provide enhanced personalized member pages complete with new information and better access. When paid members log in to their page, they can view their official record, information on their horse registration, mileage records on their horses, and directories for looking up individual members by region. If you're a ride manager, there's a section for ride manager use. Members can also set up a personal calendar where they are notified with email alerts of online calendar changes, online posting of ride results, updated point standings, new rides in your selected regions, and more. The website committee was led by Lisa Schneider with members Steph Teeter, Troy Smith, Eric Rueter, Mike Maul, and programmer Russ Humphrey. The AERC board passed the proposal to create a Young Rider Division for regional endurance awards. It will be a new division with the same awards rules as the weight division awards. Young Riders (ages 16 - 21, and unsponsored juniors) will get points and awards in their own division, and will also be able to compete with the other (Feather, Light, Middle, Heavy) divisions for overall points and awards. Thanks BOD Junior representative, Sarah Holloway, for making a great case to the board during the meeting! More information will be coming from AERC once the details are finalized. The division will be active for the coming ride season (starting December 1 2016), but there will be a transition time for results publication while the computer system and data entry are updated. Mini completes 25 mile endurance course. Completing one of the American Endurance Ride Conference’s rides can be quite an accomplishment for any horse, but for Wee B Jelly Bean, it was a truly heartwarming athletic achievement. You see, Jelly is a miniature horse (AMHR #271916A), and her completion at the Hat Creek Hustle 25-mile ride in Northern California was the first of a kind. While no one wants to have an accident, occasionally a difficult circumstance leads to finding humanity in others. Brooke Benner, from Los Angeles, Calif., learned the hard way about a stranger and his family’s kindness toward others. Benner was visiting the area in early September, when she had a bad horse accident in the middle of a 50-mile endurance race on the Kaibab near the North Rim of the Grand Canyon. She e-mailed the Southern Utah News to express her gratitude to her knight in shining armor, for his prompt action in getting her help. 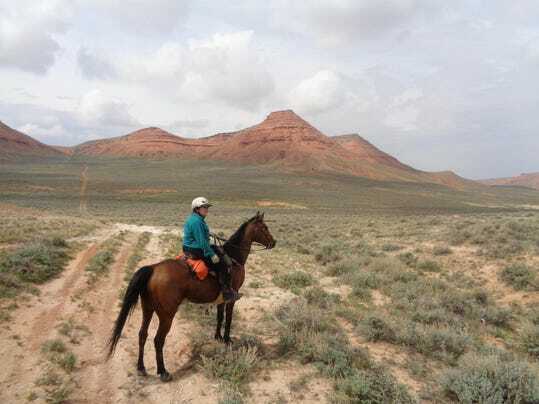 Kanab City Mayor Robert Houston happened to be waiting for a different riding group, the Red Rock Ride participants who were arriving the same day, when he observed the woman waiting for some emergency help. Vonnie Brown pauses on the trail to take in the scenery. Endurance riders often get to see places that the average person does not have access to. Big Sky Country was settled by people on horseback, and the state has always been associated with the days when cowboys rode from horizon to horizon with just their horses for company. A small group of local riders keep in touch with those Montana roots through a group called the American Endurance Ride Conference, an organization that sponsors 25- to 100-mile endurance rides across the country.